Pinterest is the greatest thing since, well, twitter. 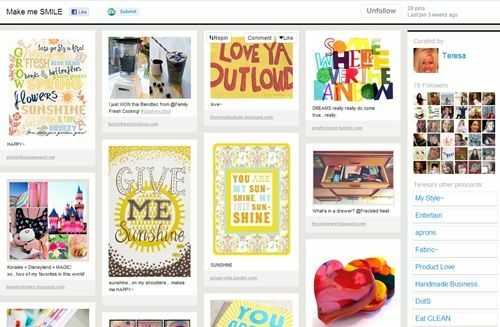 Here's the deal....Pinterest is an online bulletin board. Instead of ripping pictures out of magazine, you "pin" them and Pinterest automatically saves the link, so you can go back to the original post. I've pinned oodles of goodies pinned on a board I call "Swooning Over Food" (shocker, I know). But, "Yellow" is another one of my favorites. My favorite part of Pinterest? Seeing what other people are pinning. You can find friends or follow people you don't know (that sounds like stalking, but I promise, it's ok). I also enjoy Pinterest. The Yellow board is fun! I love Pinterest too! It's a fun thing to do with the iphone App when trying to kill time! I'm on Pinterest! Love the inspiration and being able to save stuff all to one board. I think I could easily steal your yellow page! I'm currently doing an empty spare bedroom grey and yellow. I'm dying to redo a chair in a fun fabric like that one! Wow...good thing I'm on summer vacation. This is a blast! Thanks! Yes... I LOVE pinterest too!!!!! soooo many fabulous decorating and baking ideas!!!! !Love being able to catalog my favs!!! I just started following you on pinterest. You had some amazing recipes pinned that I can't wait to try! Thank! Bridget..i had never heard of Pinterest and am i glad now..in fact i was really in need of an application like this. i have been sending links to my favorite posts in email and i should say it was no so pretty or organized. But this is fun and cute and organized..
already asked for an invite and can't wait to explore!! 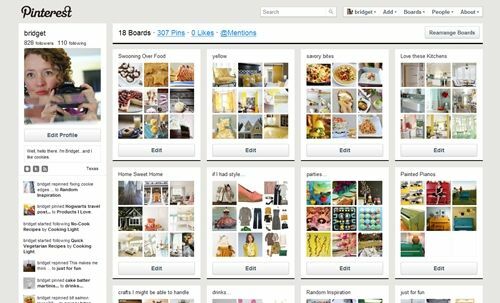 I love Pinterest too, I will be following your boards! Yup, I'm definitely addicted to Pinterest. 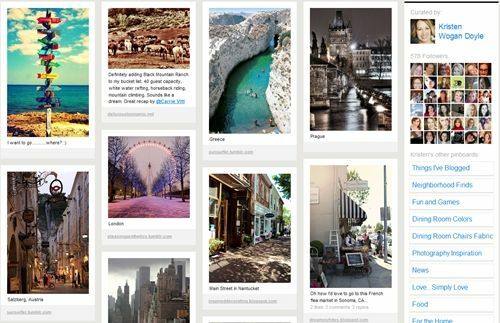 I'm a visual person so Pinterest is my kind of place! Im on pinterest, ALL.THE.TIME. Love it! oh oh oh! How have I not known about this my "favorites" list is massive - I have a feeling this will be taking up a lot of spare time this week!!! PS - your posts always make me smile! Addicted. My life is changed forever. I've heard of Pinterest and how fun it is, but never ventured into actually going to see for myself. I hear it can be addicting and that's just what I need another site to get addicted to LOL! But I'm going to check it out!! 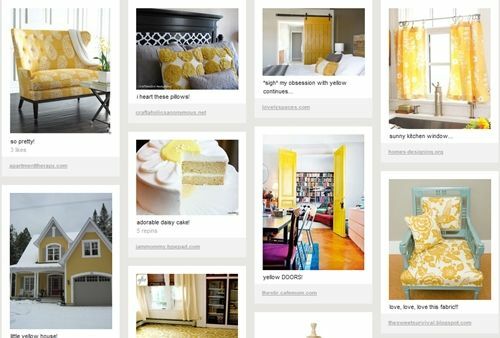 Your boards are great, I love the yellow I guess board! 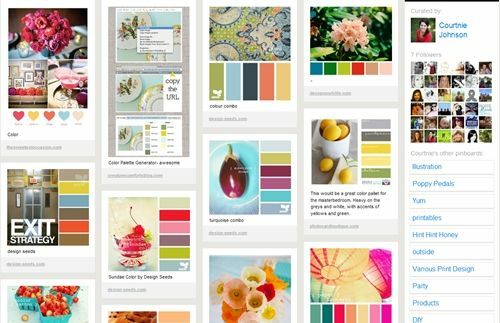 I'm getting ready to re-carpet my house and re-do my living room/dining room and I've always loved the look of yellow, grey and white with maybe a splash of red (my favorite color)so this site might help with that. Now I'm off to check out this wonderful site, that is after I clear some work off my desk (work comes first)!! I just got on pinterest last week! It's a lot of fun. I will hop on over and stalk, er, follow you! I use it as my virtual recipe box. I have a board for recipes I've tried and that worked out well, and then a bunch of different categories of recipes I want to try. Makes creating my weekly menu plan a little easier too! I've been using Pinterest for a few weeks now and am addicted! It's the perfect place to keep things and add things to so you don't have to email yourself or keep track of stuff across the internet. Love! Pinterest is so addicting! I love that it's one central place where I can store everything I like to come back to later. SO FUN! I love pinterest, too. It's like a guilty pleasure and super fun timesuck all in one--in the best way possible! Yeah. I'm obsessed with pintrest. It is definitely addictive. It looks like you've got some good boards! That yellow board is super creative! I didn't think of doing a color-specific board. I think I want to do a blue or a red. I love seeing what you saved! As per your suggestion, I just created a Pinterest account. 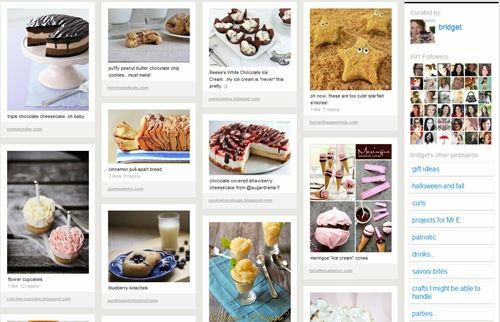 I currently have separate boards for cake and cookie decorating ideas (and some of yours are definitely on my cookie board!). I have no need for bookmarking recipes anymore either. Thanks for sharing! I need more time in my day!!!!! I just started Pinterest about 2 weeks ago and it has totally swallowed me up!! I love it!! OMG I love Pinterest. I spend way too much time there, but you get caught up in everything and lose track of time so easy. I love Pinterest as well. I'm happy to see that I'm not the only one wasting...err enjoying many hours over there pinning. I'm off to make sure I'm following you-I love that yellow board! Have a great day and happy pinning! cut it out! I love all of these. 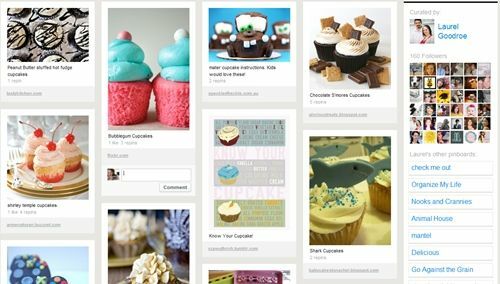 I am now STARVING from the treats pins and now I am so very inspired to try some of it! I've just jumped into the Pinterest fun this summer. WOW...it's amazing. I'm going to have to find you and follow you. It's a lot better than tearing out pages in magazines because it's all together on the computer! Happy Summer Ya'lL! I'm completely addicted to Pinterest. If you want to know what I'm doing late at night in the recliner with the laptop..that's it! I am obsessed with this site! I honestly spend hours looking for ideas! I also love your blog and have pinned some of your wonderful ideas! I have a new obsession. Thanks for turning me on to Pinterest. You should check out my boards at Pinterest.com/ecrim. oh how I love Pinterest. Thanks for picking my cupcake board!!! Does anyone have any hints on how to actually get the invite! I've sent a few requests and nothing so far. How long should I expect to wait for the invite? Days, weeks? Any info or hints anyone has would be appreciated. I can't wait to get started!! !